Client: Castan Waterfront Developments Inc.
Polson Quay is one of two important quays on the east end of Toronto Harbour. It is largely residual industrial land which has been occupied on a interim basis by outdoor entertainment functions. The plan proposes to defeat the site's depth and girth by the use of water to create islands and internal water venues for buildings rather than resorting to a cluster of towers to produce waterfront views. The site enjoys an extraordinary prospect of Toronto across water which is unique in the city. The district would be comprised of mixed use buildings organized around local streets terminating in public parks and plazas. The proposal along the shipping channel, comparable to Melbourne's River Walk, could when extended, be one of Canada's great urban promenades. 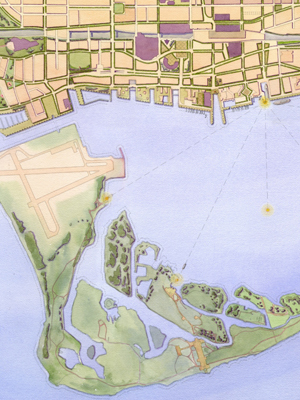 The firm has been the prime urban design consultant to the Toronto Waterfront Revitalization Corporation, an entity formed by the financial support of three levels of government to develop a $25 billion plan for the orderly development of 29 miles of prime shoreline across the lakefront of the City of Toronto. The plan, featuring 40,000 new residential housing units, 350 acres of new and improved park and public realm, private sector investment of $13 billion in land and building components, $2.6 billion investment by governments and a new "intelligence industry" district of million square feet, includes considerations about green open space, development parcels, location of landmark buildings, and transportation issues. 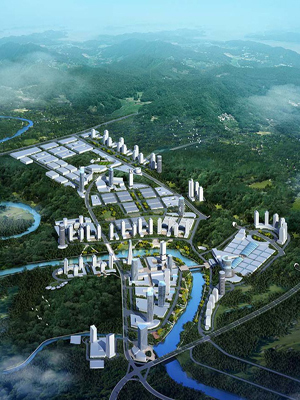 The firm has designed a master-plan for TEDA, a new city centre and economic zone with a projected population of 1 million located east of Beijing on the coast of China. 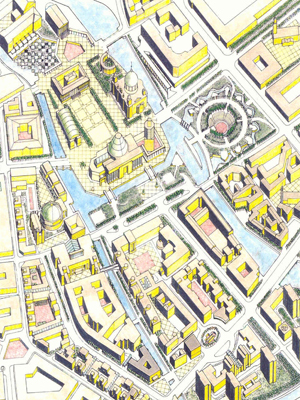 An extensive set of urban design guidelines were developed to plan the road hierarchy and infrastructure framework, build-to-plans, densities, heights, and locations of public squares and parks. 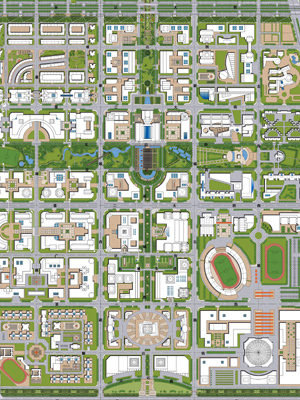 The design was examined at two scales: on a block-to-block basis and as a comprehensive master plan. Santai is a small city in Sichuan region of China, place of origin of silk worm. The 350 hectre site is a breathtaking venue of rolling hills penetrated by the serpentine Kai river. Our winning scheme proposes a series of precincts of either commercial business centre, an exhibition centre or an extensive industrial manufacturing area. 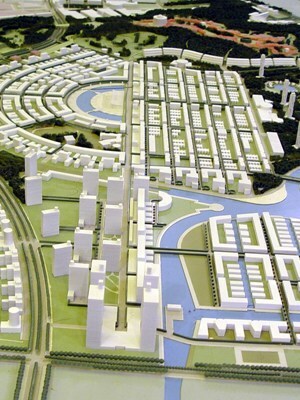 River banks allocated for mixed use and residential, all elements feature characterful landscape and solar orientation; sustainable compact development using Chinese solar panel technology to power facilities.Also the large flat roofs of the industrial area are provision for solar farms. Sichuan’s world renouned cuisine, historical monuments, the indigenous landscape, history and along with it’s Fashion district will stage it as a landmark destination. An international design competition was conducted for an 8.5sq km site contiguous to and immediately north of the Phoenix Mountain site. The design placed first among five international teams short listed. 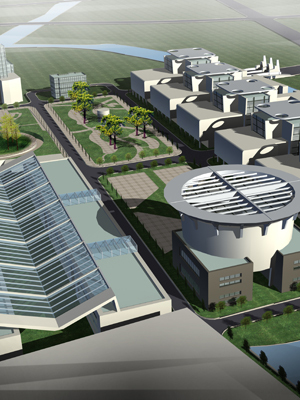 The scheme is comprised of a series of corridors and nodes. A great pedestrian canal promenade, Phoenix Esplanade, is on axis with the mountain. A series of islands formed by canals lace the Phoenix site to the subject lands. A water based naturalist area, Paradise, displays both historical area practices and a series of regeneration projects. The scheme provides a series of landmark tower sites and special precincts served by a subway system connecting the new district to Chengdu centre through the Phoenix Mountain site. This project placed first in an international competition conducted by the City of Chengdu with entries from five nations: Britain, France, U.S.A., Australia and Canada. The 10 sq km site is 40% natural parkland including Phoenix Mountain, an archeological site of some importance with an ancient tomb, a temple, and two cemeteries still in use. The site, 6 km. from the centre of Chengdu on the third ringroad, is now occupied by an abandoned military base, and agricultural land. The scheme is comprised of 9 distinct precincts designed so that infrastructure phasing can take place over an extended period of time. Districts are comprised of recognizable housing forms, some based on traditional Chinese types, and two commercial centres. There is an emphasis on variety within a rigorous urban structure of traditional streets and public spaces. This international design competition for the Spreeinsel District of Berlin in emergent East Berlin adopted local and tactical axes and symmetries to absorb a frayed constellation of architecture and archaeology at the center of the unified Berlin. Dilemmas included the fate and disposition of remnant national socialist and East German artifacts and the ambiguous relationship between the river and the on site paths, routes and streets. Our proposal honours the traditions of Qing Pu and recognizes the ambitions to revitalize the city consistent in vision and urbanity with the stature of Shanghai as an international city. Using landscape treatment, the development of new building typologies, the strategic reconfiguration of existing building fabric, and exciting new landmarks, we have made a coherent urban public realm - a durable network of public streets, promenades and spaces. 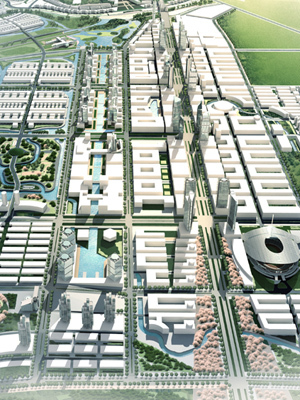 The most significant aspects of the Qing Pu revitalization proposal are the creation of a green environmental ring inside which the city will grow, and the creation of an interconnected network of three districts, the existing Old City District, the currently under construction New City District, and the proposed spectacular new Exhibition and Sports District. 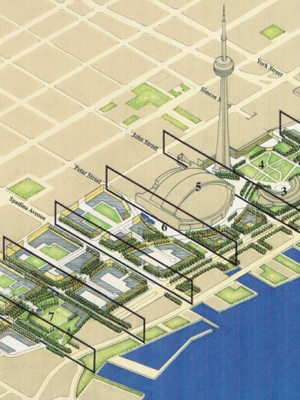 The plan was for an abandoned 80 acre site at the south east corner of the original City of Toronto. The site contained certain archeological remnants, ground pollution, and was subject to periodic flooding by the Don River, one of Toronto's principal ravine rivers. The scheme was organized around an extension of Front Street as its central spine terminating in a park on the Don River. The ground was raised generally from the midpoint east producing a flood proof dike to the river. With the creation of the TWRC in 2000 the lands were assigned to the Revitalization Corporation which through a lengthy public consultation process including UDA from Pittsburgh, confirmed the plan with revisions to the park configuration currently underway. 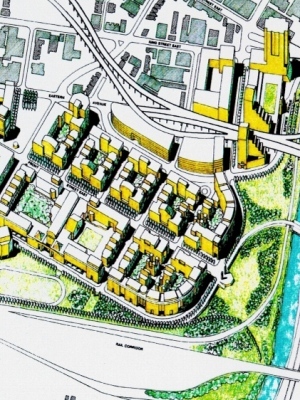 The City of Toronto retained the firm in the early nineties to assist in the preparation of a master plan and urban design guidelines for land created by the consolidation and removal of inner city railway tracks. 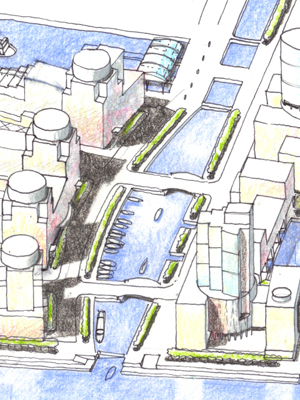 The master plan developed a primary north south road framework which reconnects the downtown to the harbour front. Planning criteria defined land uses, type and hierarchy of streets, location of parks, visual corridors and building massing and heights. © 2011 The Kirkland Partnership Inc., Kirkland Partnership International Inc.